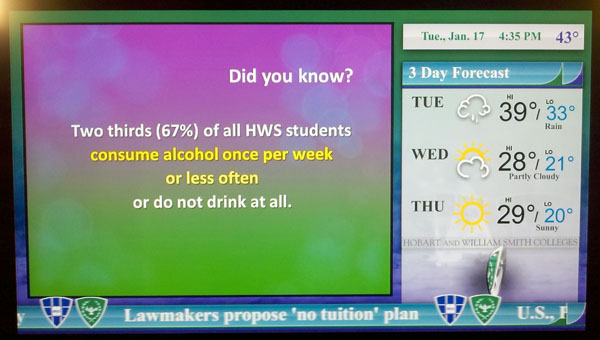 Hobart and William Smith Colleges in collaboration with the Alcohol Education Project initiated a new and invigorated social norms campaign to address alcohol and other drug abuse among its college students. This campaign has been named "JustFACTS." There are three media components to this campaign listed below. Print Posters. Each week 3ft posters are rotated through 18 locked display cases in social spaces, residence halls, and academic buildings. Posters feature campus norms for alcohol and drugs and other campus norms. Click the link below to see a set of posters from this campaign. JustFACTS Digitial Signage. Two high definition television channels have been created to display campus norms and other information to flat screen televisions across campus. One channel communicates information on the entire student body while the other channel focuses on student-athlete norms. In addition to animated screen displays of campus life and campus norms, RSS feeds of daily national news headlines, campus news headlines, and weather are displayed continuously. This way students could be watching the channel to get local weather or news and at the same time see campus norm information. A sample screen shot of the campus-wide channel is displayed below. You can see a sample video of this channel by clicking on the link below the picure. A video sample from the athlete channel will be posted soon. JustFACTS Quiz. Every Wednesday quiz cards are placed on dinning hall tables asking students two to three questions about campus norms. Some facts are about alcohol and other drug use. There are other facts about campus culture too to attract a broad group of students to think about these questions. Prizes are offered donated by local businesses for the best answers each week. If many students come up with the correct answers we hold a drawing. The back of the cards have the answers to the previous week's questions. Click below to see a set of quiz cards from this campaign.